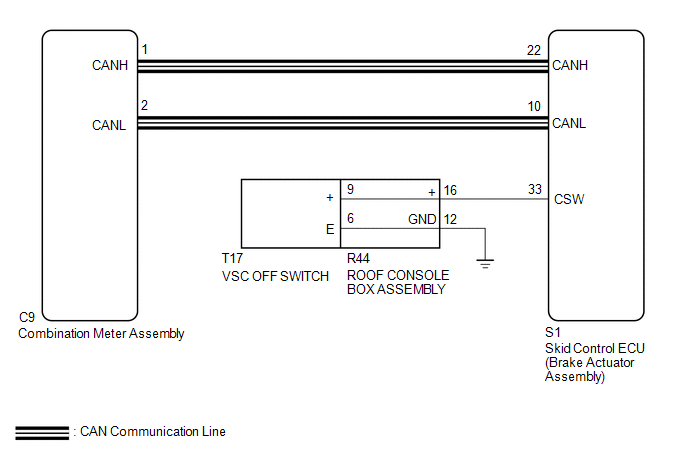 The skid control ECU assembly is connected to the combination meter assembly via CAN communication. Pressing the VSC OFF switch turns off TRAC operation, and pressing and holding this switch turns off TRAC and VSC operation. If TRAC and VSC operations are turned off, the TRAC OFF indicator and the VSC OFF indicator lights come on. When the 4WD control switch (transfer position switch) set to L4, VSC is prohibited and the VSC OFF indicator light turns on. When the rear differential is locked, VSC is prohibited, the VSC OFF indicator turns on and the TRAC OFF message is displayed. As there may be malfunctions in the touch select 2-4 and high-low system related to when the transfer operates in L4, check the touch select 2-4 and high-low system first (See page ). (a) Check if CAN communication system DTCs are output (See page ). (a) Check if the skid control ECU assembly (brake actuator assembly) connector is securely connected. (d) Enter the following menus: Powertrain / Four Wheel Drive / Trouble Codes. (d) Select the Data List on the Techstream (See page ). (e) Check that the indicator light and mode condition on the Techstream change according to VSC OFF switch operation. Indicator light and mode condition display do not change. Mode condition display is normal, but indicator light does not change. Indicator light and mode condition display are normal. (a) Select the Active Test on the Techstream (See page ). (b) Check the TRAC OFF indicator light and VSC OFF indicator light on the combination meter assembly turn ON or OFF in accordance with the Techstream operation. The TRAC OFF indicator light and VSC OFF indicator light turn ON or OFF in accordance with the Techstream operation. (a) Remove the roof console box assembly. (b) Measure the resistance according the value(s) in the table below. (a) Disconnect the S1 skid control ECU (brake actuator assembly) connector. (b) Perform the Active Test of the combination meter assembly using the Techstream (See page ). (c) Check the combination meter assembly. The TRAC OFF indicator light turns on or off in accordance with the Techstream.